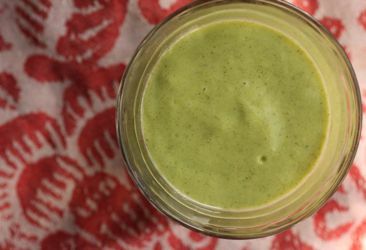 This light and creamy smoothie is made with three simple ingredients. It is so easy to make and tastes amazing! I use homemade raw vanilla almond milk which is so flavorful and full of live enzymes. I make it by soaking raw almonds in water for about 24 hours; then I rinse, drain, and blend them with fresh water, a pinch of sea salt, vanilla powder, and a dash of maple syrup. Then all you do is strain the milk though a clean dishtowel or nut milk bag to remove the pulp. You could also use Hemp Milk, cashew milk, or kefir in place of the almond milk. Place all of the ingredients into a high-powered blender and blend until smooth and creamy. This recipe makes approximately 4 cups. Drink immediately or store in a covered glass jar in your refrigerator for up to 2 days.